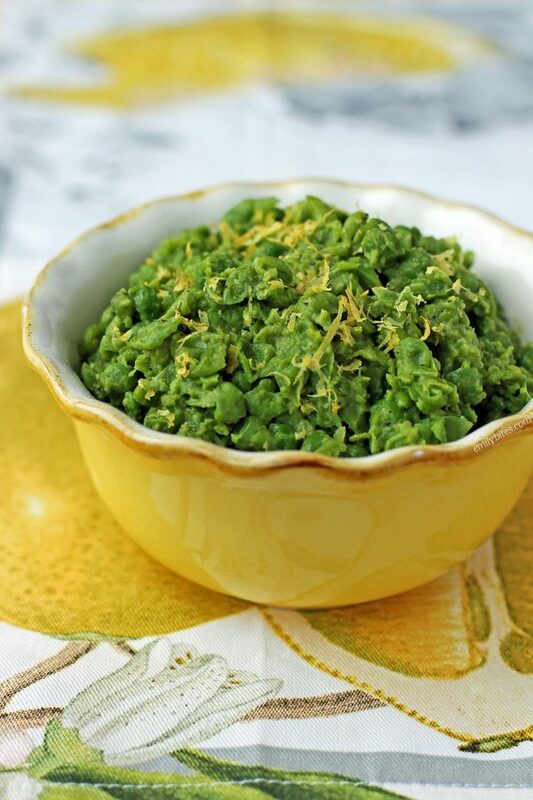 These Lemon Pepper Mushy Peas are the perfect side dish to make it feel like Spring (even if the season and weather aren’t there yet). The flavor is bright and fresh and the recipe is super simple and takes almost no prep work – my favorite! I first discovered mushy peas when I traveled to London back in 2009. Before that, I didn’t think I enjoyed peas on their own. Sure, I’d eat them as part of a pasta dish or a salad, but in a cooked pile on their own? No thanks. For whatever reason, mushy peas changed that for me and these ones take my excitement a step further. 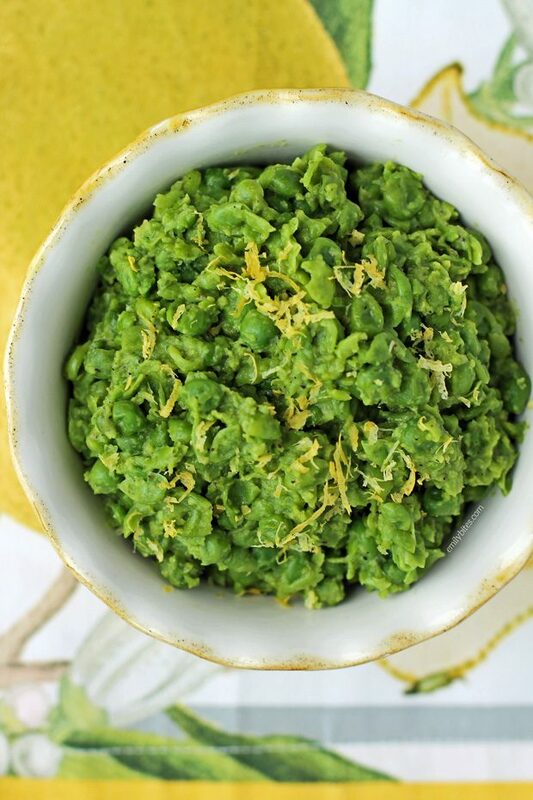 Buttery, lemony and peppery, these Lemon Pepper Mushy Peas are filling and flavorful and they pair perfectly with chicken, steak or fish. It’s easy to keep these ingredients on hand and with minimal effort you have a tasty, simple side dish ready to go! Plus, each serving is just 88 calories or 1 Weight Watchers Freestyle SmartPoint. Looking for more tasty, lightened up side dishes? Check out my Broccoli Salad, Garlic Roasted Green Beans with Almonds, Roasted Fingerling Potatoes, Spinach Parmesan Orzo, Butternut Squash Quinoa Salad, Easy Garlic Knots, Loaded Cauliflower Bake, Zucchini Casserole, Cheesy Broccoli Bake, Garlic Thyme Roasted Carrots, Cheddar Broccoli Orzo, Hummus Veggie Tots, Roasted Delicata Squash, Avocado BLT Pasta Salad, Lemon Sesame Snow Peas, Strawberry Quinoa Salad, Parmesan Roasted Sweet Potatoes, Cheesy Potluck Potatoes, Zucchini Squares and more in the Side Dishes category of my recipe index. Place the peas, butter, water and salt in a saucepan and cover. Bring over medium heat and cook for 12-15 minutes, stirring occasionally, until peas are softened. Uncover the pan and remove from heat. Use a potato masher to mush the peas to your desired consistency (mostly mushy with a little bit of chunky for texture is my preference). You may want to add another 1-3 tablespoons of water at this point to reach the consistency you like (I added 2 tablespoons). Add the lemon zest and pepper to taste and stir in to combine. Maybe using I Cant Believe Its Not Butter would lessen the point value but have the same effect?! Lemon pepper mushy is a very healthy and tasty recipe. With very less amount of calories and veggies this dish make perfect healthy recipe. I think it is very easy to prepare. Keep sharing more such healthy dishes.